All posters will be located in the conference dedicated area. 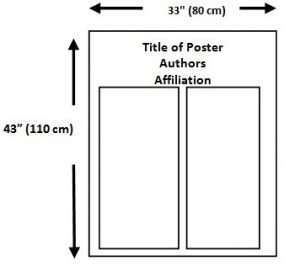 Authors should mount their posters on 27- 29, October 2015 between 9 am -5 pm. Authors should be available during breaks to answer questions, expand on the material and take part in discussions and must be wearing the official meeting badge. Accepted abstracts scheduled for poster session presentation will be grouped by topic. You will be notified by the code number of your poster via e-mail. Also check the meeting program onsite. Each author will have net MAXIMUM useable space in a portrait/vertical format that measures 33” (0.8 m) wide x 43” (1.1 m) high on a large display board. Materials should be mounted on thin, glossy colored poster paper or cardboard and mounted on the poster board under the assigned poster number that will be posted on your board prior to setup provided. All poster presenters are responsible for putting up and removing their own poster on the scheduled time notified. If presenters do not remove their poster in time, organization committee is not responsible for any damage that might happen to the poster if it is removed by staff members. Please do not hesitate to contact the Conference Secretariat at the address stated if you require any assistance before or during the Conference.